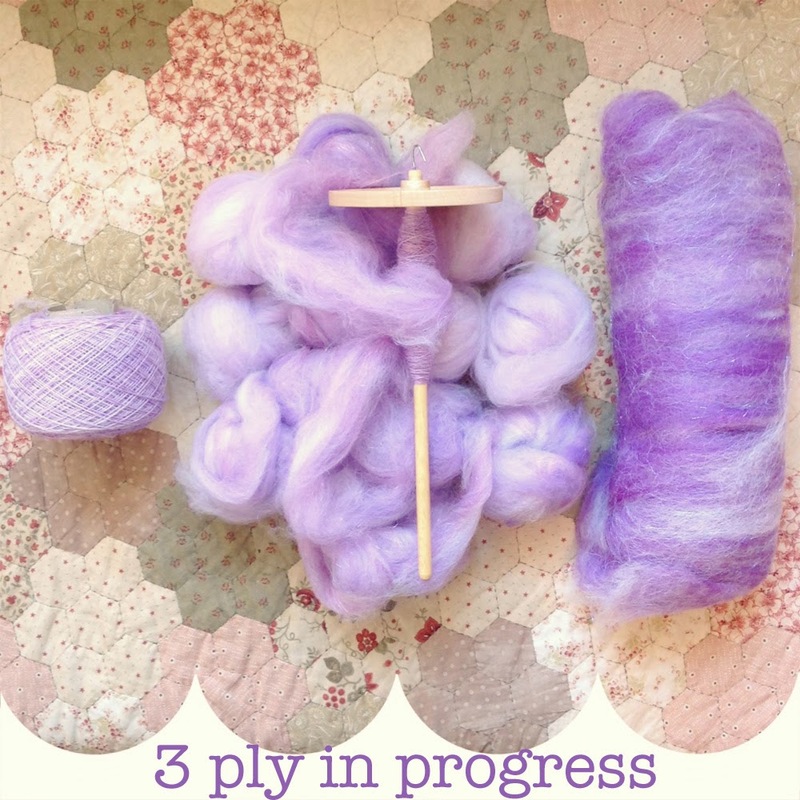 littlebobbins: The Post with ALL the Lilac!! The Post with ALL the Lilac!! As I mentioned last week I am taking part in a SAL/KAL (spin a long/ knit a long) in the A Yarn Loving Mama group on Ravelry. I thought that this would be excellent motivation to get through the mass of lilac fibre I seem to have gathered including this fluffy rolag mountain I made about 3 months ago!! The pattern we are knitting calls for a DK weight yarn and since I wanted to use my lovely 24g spindle which comfortably spins a fine yarn I decided to try out a true 3 ply. .... it was a bit of a palaver! I must be more careful next time about winding all the plies on at the same tension. and I'm pretty sure I won't work with lilac again for a good long while after finishing this shawl!! I'm joining in with the Spinning Show and Tell on Crafts from the Cwtch again today so click the link for more spinning related loveliness. Have you ever done a project that has left you with a colour fatigue? Are you taking part in any -a longs at the moment? That looks amazing! You have done an incredible job on your lilac. The yarn looks pretty balanced (to my inexperienced eye!). I finally managed to get my first entire skein of yarn done on my supported spindle done for the New To You Spin a Long which is being run by Melia of the YarnRaising Podcast. If you haven't watched her video podcast I highly recommend it as she focuses a lot on spinning and she is a mine of technical information. I can't tell you how much I'd love to dive (face-first) into the lilac fluff mountain pictured. It's all kinds of gorgeousness. Although I rarely use the colours you work with, they are actually my favourites and I always love your WIPS and FOs for this reason. I can't wait to see this finished.